For those that can afford them, a wood fire pizza oven truly is amazing. For the rest of us, there are multiple ways to make pizza on your patio without building a pizza oven. Most are almost as good as a wood fire pizza could make! What’s more, these options tend to come in at a fraction of the price. This gives you the chance to entertain your friends and family with amazing home cooked pizza, without needing to break the bank to do so. With that in mind, let’s take a look at the various approaches that you can take and which ones may work best for your specific needs. If you want to make pizza on your patio, the simplest solution is to buy a pizza oven that is all ready to go. Now, I’m not talking about a large wood fired oven that is going to set you back a thousand dollars or more, although patio versions of those do exist. Instead, I’m talking about countertop and portable pizza ovens. Typically, these tend to be gas powered, operating from a propane bottle. Some do use wood though, namely the Uuni 3, which is my favorite. This style means that the pizza oven itself is often relatively small and also tends to be fairly inexpensive. For example, many of the models out there are less than $300 and there are some that are closer to $100. Some of the most interesting brands and options that you can rely on include the following. The Uuni is made in Europe, so it takes a while to ship and get to the USA, but it's worth it. The Uuni uses special wood pellets to heat the oven, so you get the wood fired flavor and effect. Just check out the flame going on this Uuni! I like the Uuni 3 (newest model) a lot because it is very inexpensive, very small, and very portable. It looks slick, and is definitely something that will get some comments from your friends. But most of all it cooks authentic wood fired pizza at a fraction of the cost of anything else. 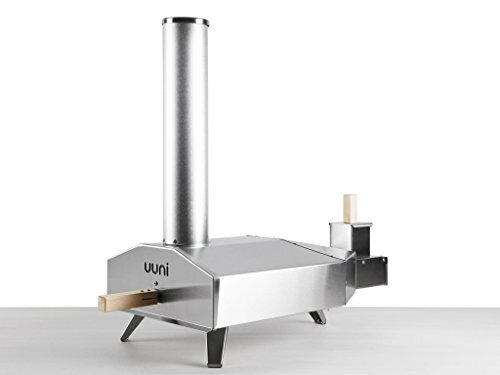 You can do it for a similar cost of a some of the barbecue conversion options below, but if you don't have a barbecue that fits those conversion kits, then the Uuni is a great standalone product. ==> Get The Uuni 3 Here! 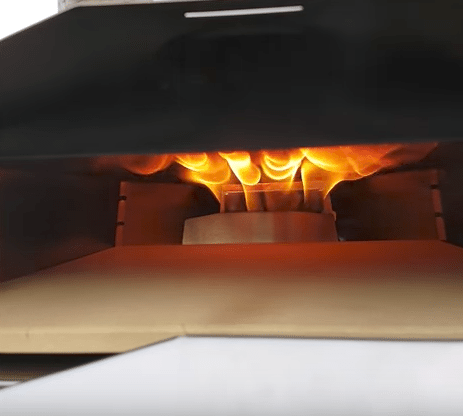 Check out the Uuni 3 in action below. Another incredible wood-fired option is from Forno Bello. No, it's not that cheap, but yes, it's still cheaper than building a brick oven! This one uses real wood instead of pellets like the Uni, so it's quite a bit bigger. It is portable though – notice the wheels at the bottom. This makes it great to roll out during summer, then roll back into the garage or under the awning during the winter. 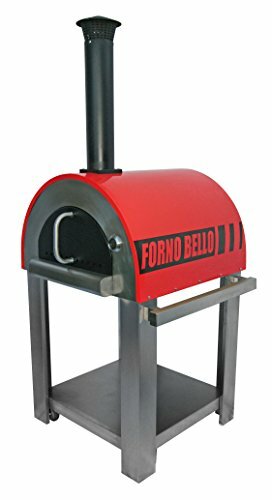 Learn more about the Forno Bello in the video below! As the name suggests, the Camp Chef brand mostly focuses on products that help you cook great food while you are camping. That’s true for this pizza oven as well, since it runs off a propane bottle. However, this style can work well, as it creates a highly portable pizza oven that is still very effective. This overall style even looks like a small pizza oven and can easily be used on an outdoors countertop or just a table. Likewise, a pizza oven like this is great for tailgating, as you can easily move it from one place to another. 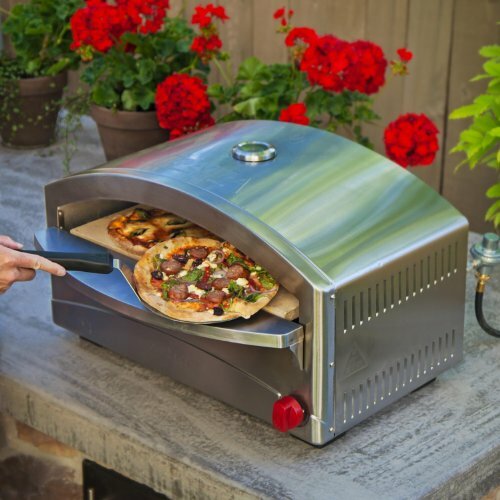 Pizzacraft strongly specializes in home pizza making, so it’s no wonder that they have some products for the patio. 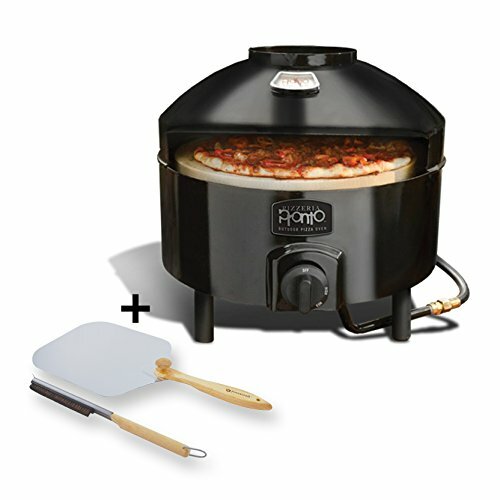 In particular, the company offers two different countertop pizza ovens, which are the PizzaQue and the Pizzeria Pronto. The first of these, the PizzaQue, is fairly simple and is also one of the cheapest countertop pizza ovens out there. It works with a 20 lb propane tank and includes a 14-inch pizza stone. In terms of cooking, the oven takes around 15 minutes to preheat and can cook a pizza in around 6 minutes. The product also comes with a leg kit and this gives you the ability to make it freestanding, if you want that. In contrast, the Pizzeria Pronto is a more expensive model that also seems to perform better overall. For example, the company estimates that this one just takes 10 minutes to preheat and pizzas are cooked slightly faster as well. The time differences may not be much but they would be significant if you were trying to prepare multiple pizzas. Of the two, the Pizzeria Pronto also looks better visually and is sturdier overall. But, they do both cook the same size pizza (12 inches), so there isn’t a large difference in function. As a result, either option would be a good choice for making pizza on your patio and both do receive good reviews overall. The previous examples are all designed to be used on a countertop, which would be perfect for many patios. However, there are also many freestanding designs. These have the advantage of already being at the height you need. Plus, they may be critical for anybody who doesn’t have an outdoor counter to rely on. 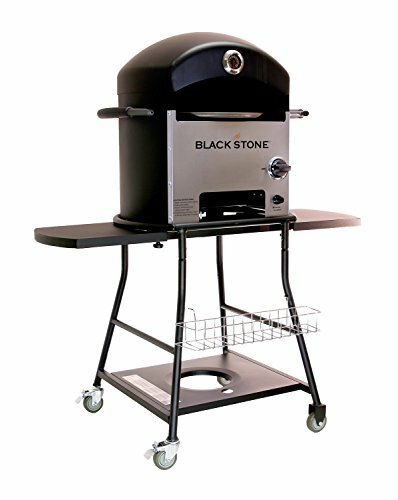 One such product is this Blackstone Outdoor Pizza Oven. The design also includes a place for you to put the propane bottle while it is in use, making your entire setup easy to move. There are also some interesting features with this product. One of these is the use of a rotisserie motor. This is used to rotate the pizza stone and helps ensure that your pizza cooks evenly. Doing so is much more efficient than trying to turn your pizza by hand during cooking. The oven here is also larger than the countertop examples from before. In this case, you can cook up to a 16-inch pizza. The power isn’t quite as good as the countertop versions though, with most estimates suggesting that it can get somewhere between 500°F and 600°F. That temperature is lower than ideal, although you would still get amazing pizzas. As the previous section shows, there are many different options for buying an outdoor pizza oven without building your own. This can be a good way to go, especially as many of the products are reasonably priced. But, you can also make your own pizza oven by converting what you already have at hand – your grill. Doing so is particularly great for small spaces, as you don’t have one more piece of equipment to worry about. Besides, why not? Your grill is a great tool, so why not get the most out of it? 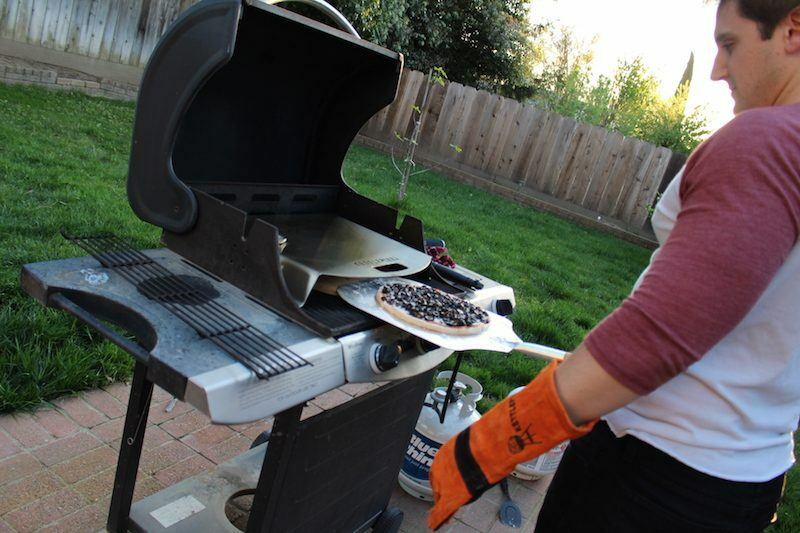 The simplest way to use your grill in this way is to cook pizza directly on it. Alternatively, you can just use a pizza stone or some type of tray that will conduct heat. Those ideas can work but they are limited. In particular, your grill will never get hot enough to produce amazing outcomes. Ideally, you should be cooking at 700°F or higher for great pizza. But, there’s no way your grill will get to that temperature without some additional help. For that matter, even some of the pizza ovens from above didn’t get this high. Thankfully, there are some products that you can use to reach the ideal temperatures. By far, gas grill conversions are my favorite way to make pizza outdoors. One reason is that the idea is just so easy to achieve. 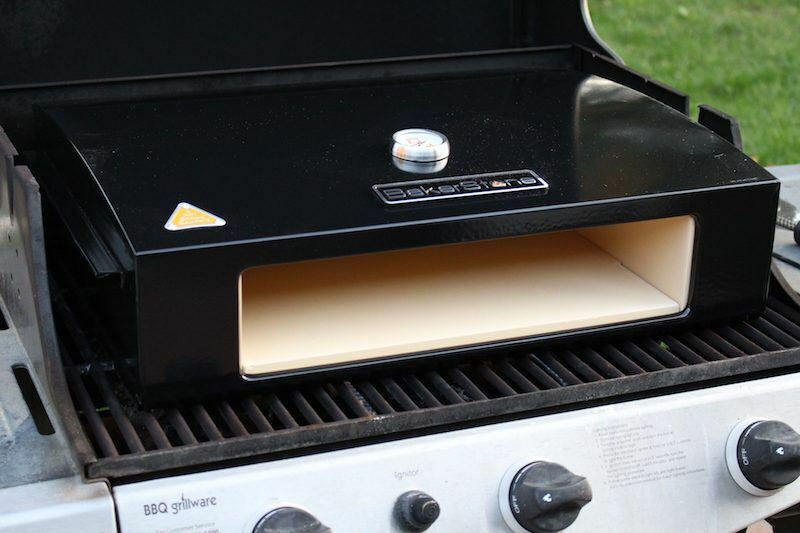 In many cases, the conversion is as simple as adding a product on top of your grill. Doing so makes it easy to convert from pizza oven to grill and back again, as the need arises. This is the KettlePizza Gas Pro and it is an extremely simple idea – as you can see. Basically, you’ve just got a single piece of metal with a handle and a temperature gauge. You then put a pizza stone under it and cook your pizza that way. This makes for a very authentic experience and amazing pizza. The general design acts to trap the heat and the company claims that the pizza oven will reach 700°F or higher. I haven’t tested this with an infrared thermometer yet but the oven does certainly get as hot as you need it to. In theory, you could make your own with metal or even tinfoil. But, I’ve tried that and getting the temperature exactly right is no easy feat. You also tend to end up with something difficult to use. As a result, it really is worth investing in a professional product, like the KettlePizza Gas Pro. You can read my full-length review for the KettlePizza if you want more information about how it works, including a video of it in action. Alternatively, you can just pick one up yourself from Amazon. Another cool option is the BakerStone Pizza Oven Box. 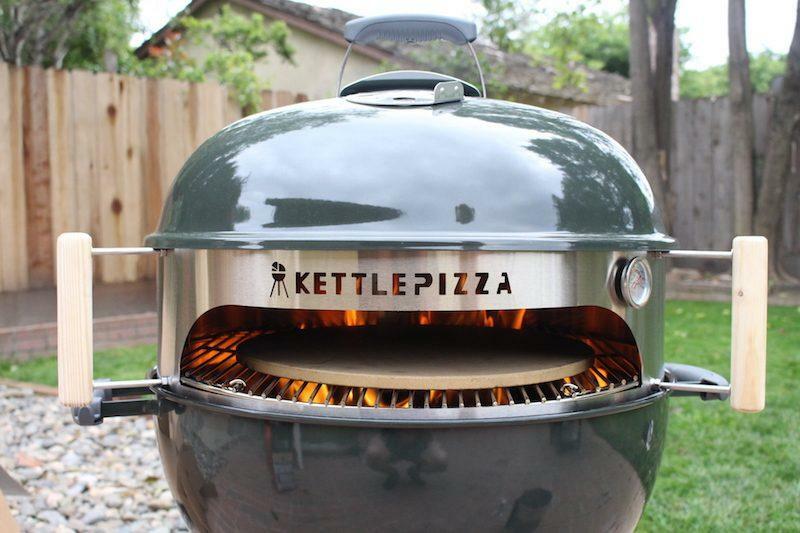 Like the KettlePizza Gas Pro, this product simply sits on top of your grill and is extremely easy to use. But, in this case, you have something that is self-enclosed and you don’t need an additional pizza stone. Instead, the interior of the box is made from cordierite pizza stone and it does get fairly hot. I haven’t measured it myself but online information suggests the max temperature is somewhere between 750°F and 900°F. As with the previous example, you would control the temperature with your grill, rather than with the device itself. Overall, I did really enjoy my experience with the pizza box and it is a very good way to make your own pizza. But, it does have downsides too. For one thing, the self-enclosed nature makes the product harder to clean. It also takes longer to heat up than the KettlePizza and is a little more difficult to maneuver your pizza into the BakerStone box initially. Still, both choices are very viable, especially as the box is considerably less expensive than what KettlePizza offers (which is somewhat surprising given their appearances). You can ready my review of the Bakerstone, or you can pick up the box from Amazon. I also have a full comparison of the BakerStone vs the KettlePizza, if you’re trying to decide which to go with. There are other products out there as well and I’ve covered some of those elsewhere. But, for most situations, these two options are the most viable choices and they are both effective for making pizzas on your patio. Gas grills aren’t the only options for you own pizza oven. Instead, you can do roughly the same thing with a charcoal grill as well. However, there are some extra challenges involved. For one thing, converting a charcoal grill to a pizza oven typically involves using an insert of some type. The idea is so that you can leave the lid on while grilling, which helps ensure that your makeshift pizza oven gets hot enough and stays at temperature. The idea works well but there is more effort involved in setting it up. It’s also a little more difficult to convert back and forth between pizza oven and grill. That aspect can sometimes be a pain. I love the idea of a charcoal grill conversion and I’ve found a few products that work really well for this role. Of the two styles, I do prefer the gas. Still, a charcoal conversion has its advantages too, especially as a charcoal grill is more portable overall. 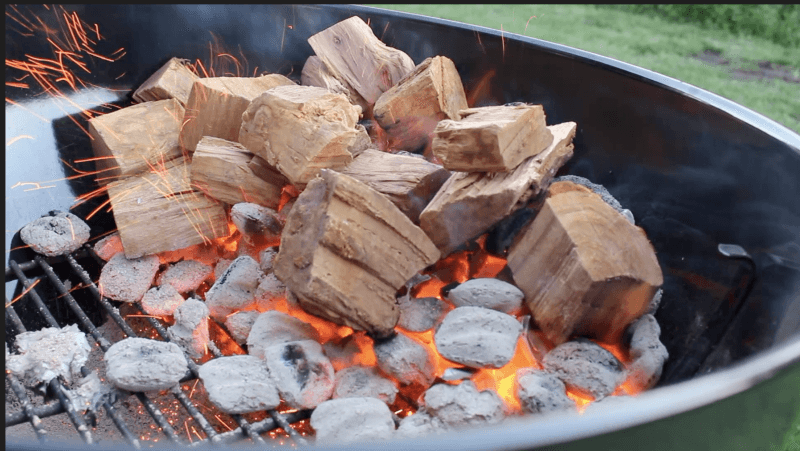 Plus, you’re using actual fire and will typically be burning both wood and charcoal. This gives you some of the smoky taste you would traditionally get with a pizza oven. The best product that I’ve found for this is a KettlePizza Weber Grill Insert. This was actually KettlePizza’s original product, which is where the brand name comes from. One difference between this and the gas option is that the insert is just for one style of barbecue, a Weber grill. The idea here is to trap heat in, creating the high temperatures that you need for artisan pizza. To get the best outcomes, you do need to use wood as well as charcoal. But, doing so is great for flavor anyway. 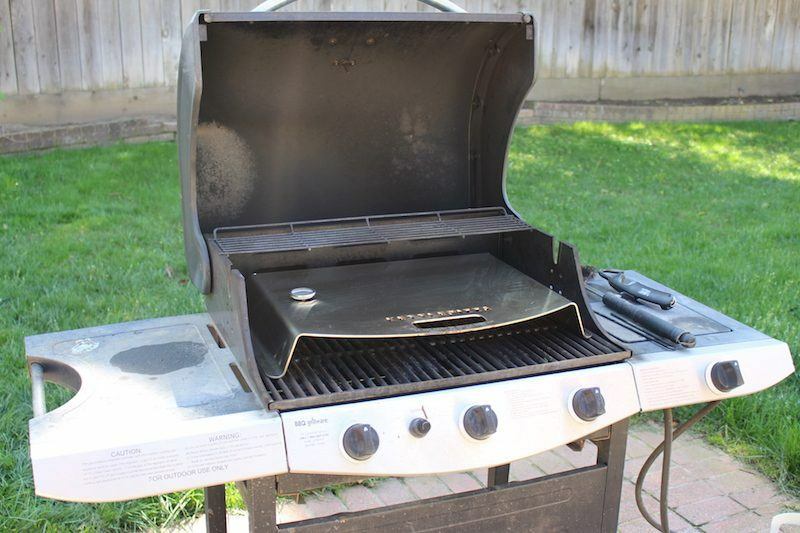 I’ve spent considerable time working with the grill insert and you can read my full-length review on it for more information. Of the two styles, I did find the gas option easier and faster. But, this is a viable alternative as well and may be better for some situations. There are also other brands out there that offer similar products. The most similar one I found was the PizzaCraft PizzaQue, which also comes from a good brand. The general idea is exactly the same, although I found that the insert didn’t look as good and seemed less stable. Still, the big advantage is price, as the PizzaCraft PizzaQue is considerably cheaper. It also has a charcoal fence and that helps you to get a more even spread of fuel. Personally, I would still go with the KettlePizza option but if you’re on a budget, the PizzeQue could work. 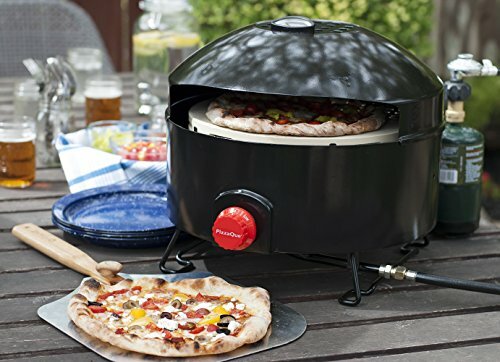 I also found the OnlyFire Pizza Oven Kit and the LandMann Pizza Kettle Charcoal Grill. Both have a similar idea, although the latter option requires you to buy the entire grill, not just the insert. These ones don’t have as many advantages, although you might choose the LandMann if you don’t currently have a grill of your own. At the end of the day, making pizza on your patio is a very achievable goal and you don’t have to invest in a wood fire pizza oven to do so. Instead, a small gas pizza oven or a barbecue conversion will offer you most of the same advantages for a much lower price. 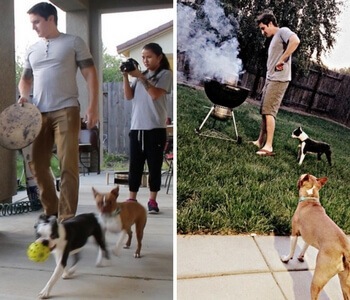 Of the two styles, I personally prefer a grill conversion. In my own experience, this simply works better and this approach will often reach a higher temperature than a portable pizza oven. 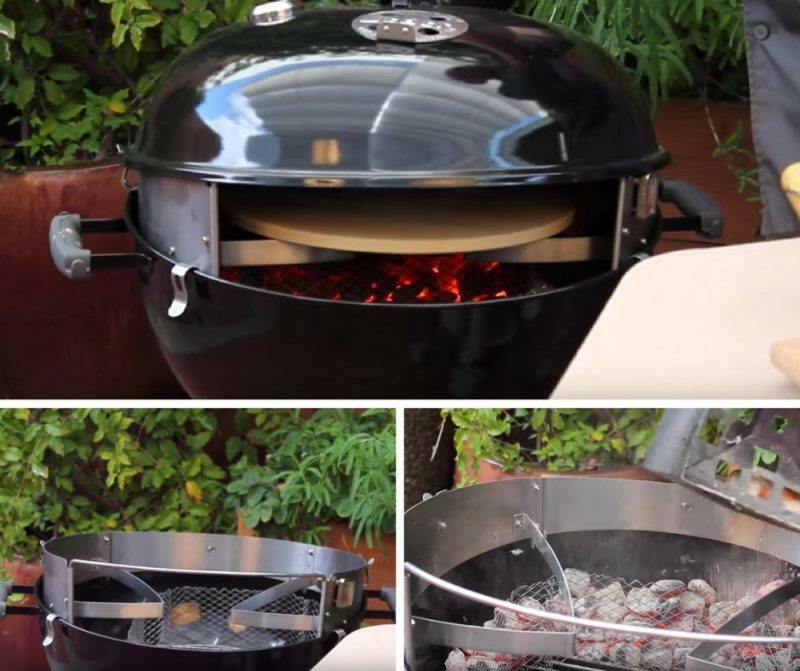 Still, if you want to use the grill and the pizza oven at the same time – or if you don’t have a suitable barbecue for conversion, an independent pizza oven could end up working well. Either way, there are many different types of pizzas that you can make from the comfort of your backyard.